If you’re thinking about adding a pool to your property this year, you may think you’ve dotted all the I’s and crossed all the T’s, but more often than you might think, there are still some considerations that haven’t been made. Even the most meticulous planners are prone to forgetting a few things during the pre-design and installation process. Not to worry: the expert custom pool designers here at Crites Custom Pools have put together a pre-design checklist for you so that you can make sure that you’ve considered every aspect of adding a new pool to your property. The first step in the pool-design process is to figure out what you want, and that means you’ll need to add a few words to your vocabulary. Porch suggests that you learn about features like a Baja shelf (a flat, shallow area), beach entrance (a pool with no stairs, just a gradual decline from shallow to deep) bubblers (aka fountains), coping (stone masonry used at the edge of the pool) and more. Once you know the lingo, you’ll be able to easily and effectively communicate what you want your pool to look like to your builders and designers. That way you won’t have any confusion during your discussions with the design team and can be assured that your design and installation results in the exact pool you envisioned. Once you decide on a direction you want to go in with the pool design, make sure you’re allowed to install it how you want it. Popular Mechanics says to check with your local building department or zoning board to learn what you’re allowed to do and any regulations you may need to follow. There will often be specific limits and restrictions that vary from county to county and even town to town. For example, sometimes there is a minimum distance for how close a pool can be located in proximity to a property line or how deep your pool can be – even whether or not you can install a diving board. Don’t spend time and money planning a pool that can’t be built. Know the rules in your area and how they will play a role in your design. This item on the checklist is simple, but important. Come up with a number that you can comfortably spend, and then stick to it. If your budget is tight, you may need to skip the in-pool cocktail area, but that won’t stop you from enjoying cocktails on the pool deck with your friends. Know what you can afford, and plan a pool that meets your needs and your budget. Talk to your homeowners’ insurance company to make sure your policy is updated to include coverage for a pool. 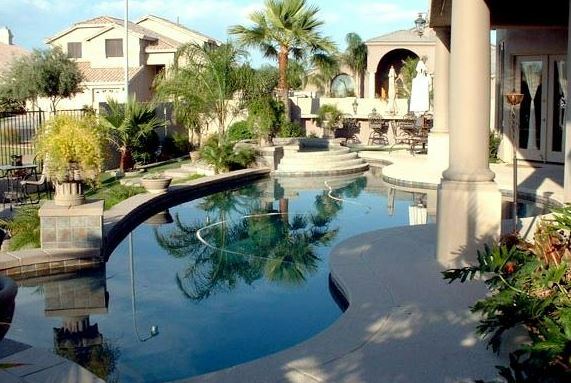 You may find that your premium will increase, so make sure to contact them before you start building so that you know what to expect once your pool is complete. Once you’ve considered all these factors, the last step is to design and build. If you’re looking to add a pool to your property this year, let the team at Crites Custom Pools guide you through the process. Our pool experts can give you information on styles, pricing and more so that you can start building your dream pool as soon as possible. Get started on your new custom pool design by calling us today at 512-759-2630.